Впечатляющий крупногабаритный двухмоторный транспортно-пассажирский самолет Albatros L.73 был разработан по заказу авиакомпании "Deutsche Lufthansa" специально для ночных полетов. Конструкция биплана почти полностью выполнена из металла, обшивка - полотно ДальшеMore>>> и легкий алюминиевый сплав. Самолет снабжен неубираемым шасси. Два двигателя BMW установлены справа и слева от фюзеляжа между крыльями. Первый и второй пилоты размещены в кабине рядом. Кабина пилотов открытая, но снабжена ветровым стеклом. Управление самолетом двойное. На самолете установлены радиостанция и примитивный гироскопический авиагоризонт. Полностью закрытая пассажирская кабина отличалась высоким потому времени уровнем комфорта. Она была оборудована обогревом и вентиляцией. Восемь пассажиров размещались на комфортабельных сиденьях, а в задней части салона имелся туалет. Четыре сиденья могли конвертироваться в два спальных места. Всего построено два самолета, переданных заказчику в 1926 году. До 1930 года они летали как на внутренних, так и на международных воздушных линиях, в основном - ночью. WITH the raising of the restrictions hitherto placed by the Allies on German aircraft construction and operation, there is considerable activity of late in the German aircraft world, and several new types of commercial German machines, apart from those which took part in the recent seaplane competition at Warnemunde, have been produced, while others are rapidly coming along. A German designer with his hands tied is one thing. A German designer at liberty to do as he likes is quite another, and there is every probability that during the next few years the German Aircraft industry will make a very determined effort to secure a leading place in commercial aviation. Germany is favourably situated geographically for developing civil aviation, and it is no secret that, while they were prevented by the restrictions from doing very much actual construction, German designers and aeronautical scientists were working hard in the drawing offices and laboratories against the time when Germany should once more be able to take its place among the nations of Europe. The results of the work thus quietly but no less seriously carried out should be felt during the next few years, and it therefore becomes a matter of no little interest to follow as closely as may be the steps by which Germany is building up her fleet of commercial aeroplanes. Some months ago we described and illustrated the single-engined biplane with slotted wings which was produced by the Albatroswerke of Berlin-Johannisthal as a newspaper carrier for the Berliner Zeitung. That machine was designed in the main by Dr. Ing. Gustav Lachmann, who has now severed his connection with the Albatros Works and taken up a position in Japan. Herr Schubert, who has been chief designer of the Albatros firm for a number of years, and who visited, with Herr Robert Thelen, one of the earliest German pilots, the Lympne light 'plane meeting in 1924, has recently turned his attention to twin-engined commercial aeroplanes, and the first of these to be produced is the Albatros L.73 which forms the subject of the following notes and illustrations. As already mentioned, the Albatros L.73 is a twin-engined machine, the engines fitted as standard being 240 h.p. B.M.W. 's of the type IV, similar to those used so extensively in the recent seaplane competition. These engines are six-cylinder verticals, and are mounted on the inner interplane struts, which are of somewhat complicated arrangement designed for perfect triangulation. The radiators are mounted between the leading edge of the top plane and the engines. The petrol tanks are, as already indicated, housed in the top centre section, each having a capacity of 360 litres (79-25 galls. ), and direct gravity feed is provided, each tank supplying its own engine. Length o.a. 14-6 m. (47 ft. 10 in.). Height 4-7 „ (15 „ 5 „ ). Span 197 ,, (64 ,, 7 „ ). Wing area 92 sq.m. (990 sq.ft.). Weight empty 2,914 kg. (6,420 lbs.). Instruments, etc. 10 „ f 242 „ ). luggage, etc. 160 ,, ( 352 ,. ). Paying load 800 kg. (1,760 lbs). Crew 160 kg. ( 352 lbs.). Petrol 520 ,, (1,143 „ ). Oil 50 „ ( 110 ,, ). Cooling water 52 „ ( 115 ,, ). Total flying weight 4,610 ,, (10,142 „ ). Power loading (full load), 10 kg./h.p. (22 lbs./h.p.). Flying weight with half paying load, 4,210 kg. (9,275 lbs.). Power loading with half paying load and one engine stopped, 38-6 lbs./h.p. Maximum speed (ground level) at full load and power, 145 kms./hrs. (90 m.p.h.). Maximum speed (ground level) with half paying load and one engine stopped, 110 km./hrs. (68-4 m.p.h.). Landing speed with full load, 95 km./hrs. (59 m.p.h.). Ceiling (full load), 3,000 m. (9,850 ft.). Climb to 1,000 m. (3,300 ft.) in 14 mins. ; to 2,000 m. (6,600 ft.) in 32 mins. Built mainly of metal, the L.73A exhibited by the Albatros Works is a development of the earlier type L.73, which was nicknamed the "Schlafwagen" on account of the type of seats used, which could be tilted back to form couches for night flying. The machine is of fairly orthodox design if one accepts as such a twin-engined type, which is now disappearing in this country. The L.73 A is powered by two Bristol "Jupiter VI" engines, and is stated to be very pleasant to fly, and to manoeuvre well, even with one engine stopped. Whether the machine is definitely able to fly level on one engine we were unable to ascertain. 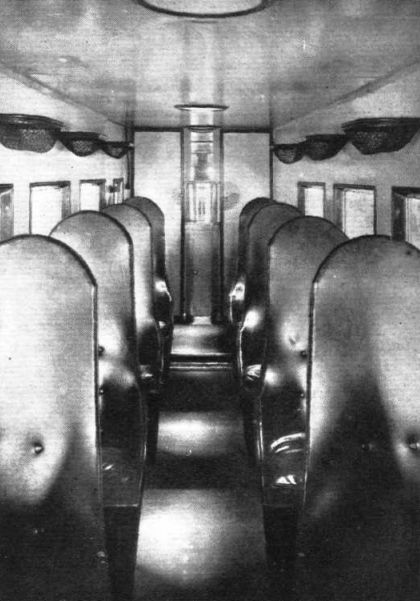 The very comfortable cabin has eight seats for the passengers, and these seats are so arranged that when the machine is used for operating a night service they can be tilted back to form not uncomfortable couches. Whether the machine has ever been regularly employed on a night service we do not know. The type is stated to be in service on the lines of the Luft Hansa. The main dimensions and weights of the Albatros L. 73 A are as follows: Length o.a., 14-9 m. (48-9 ft.); wing span, 19-7 m. (64-6 ft.); wing area, 92 sq. m. (990 sq. ft.). Weight empty, 3,300 kg. (7,260 lbs. ); permissible useful load, 2,200 kg. (4,840 lbs.). Total loaded weight, 5,500 kg. (12,100 lbs.). Maximum speed, 175 km./h. (109 m.p.h. ); cruising speed, 160 km./h. (100 m.p.h.). Range at full throttle (5 hours), 875 km. (543 miles). Range at cruising speed (6 hours), 960 km. (600 miles). Climb to 1,000 m. (3,280 ft.) in 7 minutes. Ceiling, 3,200 m. (10,500 ft.). Было построено два экземпляра L73, получивших собственные имена "Preussen" и "Brandenburg". Эксплуатация этих самолетов авиакомпанией "Lufthansa" началась в 1926 году. THE ALBATROS L.73: This new German passenger-carrier, here shown in side view, is fitted with two B.M.W. type IV engines of 230 h.p. each. The cabin has seating accommodation for 8 passengers. THE ALBATROS L.73: Three-quarter rear view. It will be noted that there is no fixed vertical fin, but that the rudder has a large horn balance. The "Schlafwagen": The Albatros L.73 has its seats so arranged that they can be tilted to form couches at night. The Albatros L.73: Three-quarter front view of the fuselage, showing centre-sections, wing-engine mountings, &c. The bracing of the top centre-section is unusual, having no struts to the front spar. THE ALBATROS L.73: This view in the cabin, looking aft, shows the 8 seats. The back rests of the seats can be tilted to various angles, and for night flying every two seats make one sleeping berth, the seats being tipped up by means of handles and catches. 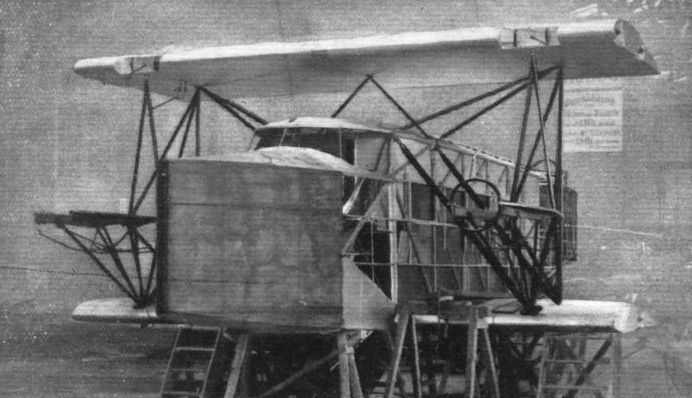 For handling on the ground the Albatros twin-engined commercial machine is provided with tubular hand-rails under the stern of the fuselage.